If you’ve ever used Cycorder and got a call or you’ve ran out of memory during a video you know how annoying it is when you go to the video and it won’t play. No matter how hard you try it won’t play back. Some people simply give up, others pay quite a lot of money to a repair company. I’ve done quite a few videos now and my service has been fully tested and worked 100% of the time. So if you have corrupted Cycorder videos you want fixed or know someone who does I will get them fixed and back to you within less than 1 hour after payment in most cases. Send the file to sbraidley [at] yahoo.co.uk (include any discount codes at this point). I will then download and fix the file and email you with a quote of price and a screenshot of the video for proof if requested. Send the payment via PayPal in your preffered currency, either USD or GBP and make sure that it’s sent as Personal Payment Owed. Once payment is received I will immediately upload the file back to WeTransfer for you to download. You now have your fixed video. At the minute I’m charging a flat fee of $25/£15.60 per GB (The price is determined by the repaired video size and not the corrupt video that is sent). The video can be any length and sound is also processed with the video unlike some other services. I can also promise that you file will never been seen by anyone but you, videos are checked that the process has worked but this does not require the video to be played. I tweeted it out yesterday but I’d like to inform you all that I have started a service which means you can get corrupted cycorder videos fixed very quickly and very cheaply. If you’ve ever used Cycorder and got a call during a video you know how annoying it is when you go to the video and it won’t play. No matter how hard you try it won’t play back. Some people simply give up, others pay quite a lot of money to a repair company. Today I come to you with the cheap alternative, it’s obviously early stages and I might start a website up and everything specifically for the service soon but for now it’s a referral based service. So if you have coruppted cycorder videos you want fixed or know someone who does I will get them fixed and back to you within less than 1 hour after payment in most cases. Send the payment via PayPal and once payment is received I will immediately upload the file back to WeTransfer for you to download. At the minute this is just a small project I’m running to see how many people will be use the service. The pricing is very reasonable and official pricing will be announced later. If you want to get a quote before you send the file, email me at the address provided with the size of the file and I’ll get back to you. Also bulk pricing will be cheaper so if you have 10 videos you can get them all done at once for cheaper than separately. It is mainly aimed at cycorder videos but I might be able to fix any .mov file. Note: Some videos have audio sync issues which I won’t fix as part of the service but it’s quite simple to do. The day has finally come, comex has released Spirit, the first userland jailbreak since the 1.x era. 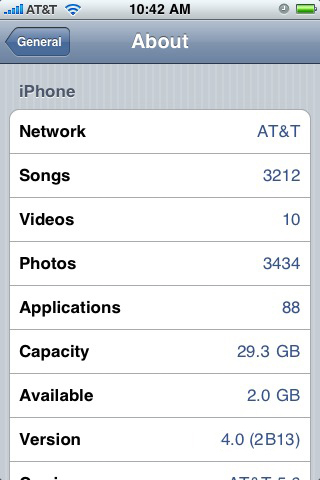 It runs on the latest iPhone OS firmwares (3.1.2, 3.1.3 and 3.2). Spirit is an untethered jailbreak which comes as great news to many 3rd generation iPod Touch & iPhone 3GS users who have the MC models who were stuck with a tethered jailbreak for months. It works on all the iDevices but on the iPad, all this is still sort of beta. Some packages in Cydia, not designed for iPad, might screw up your system and require you to restore. iPhone OS 4.0 Only For 3G and 3GS? According to a source, the new iPhone OS 4.0, which is rumored to be shown at the upcoming Apple event; will include multitasking, which has been wanted for a long time but many iPhone users but only those who jailbreak the device can use this feature. The source also says there will be a new UI, “to make navigating through the OS easier and more efficient” and also OS-wise mutli-touch gestures. However I see it unlikely that Apple will majorly change the UI of the OS as they like to keep things familiar. The source also says how they will also be “some brand new syncing ability for the contacts and calendar applications” but that the new OS will only be available for the iPhone 3G and 3GS, this makes sense for the multitasking as the iPhone 2G doesn’t have enough RAM to be able to multitask properly.